White chocolate and lemon is a great combination, the sweetness of the white chocolate and the fresh twist of lemon. 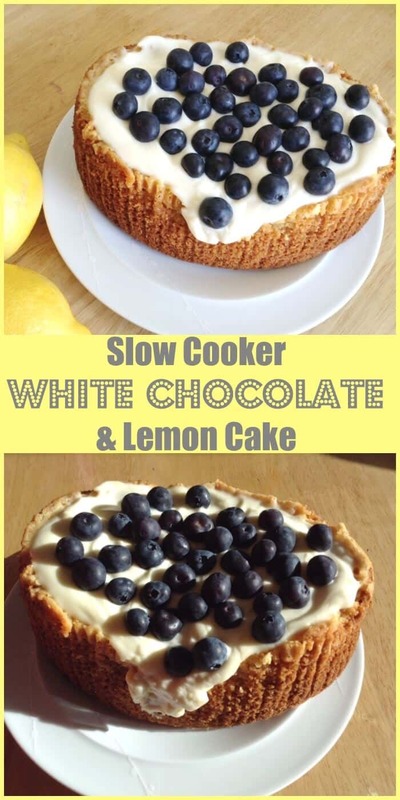 A slow cooker cake doesn’t have to be served from the slow cooker pot warm, you can also make a cake you can slice and serve like an oven baked cake. 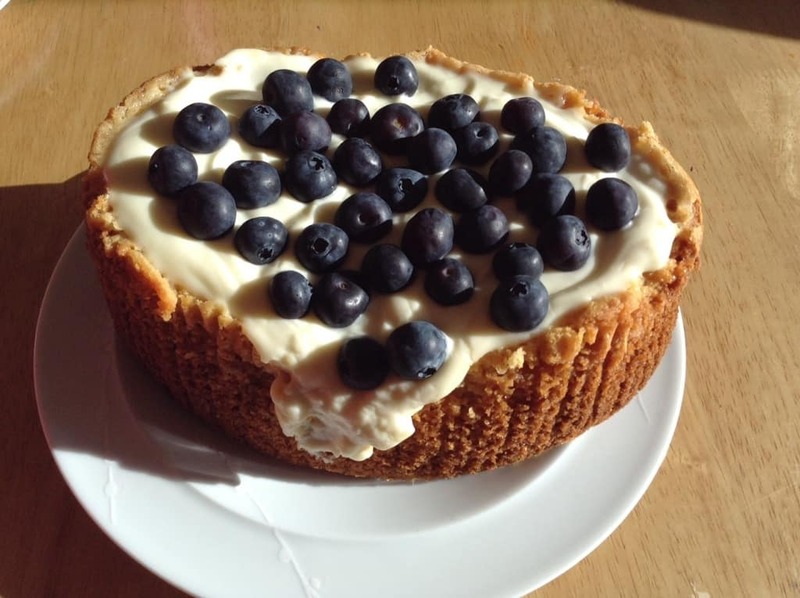 Top it with creamy icing and blueberries and it is fit for any occasion! 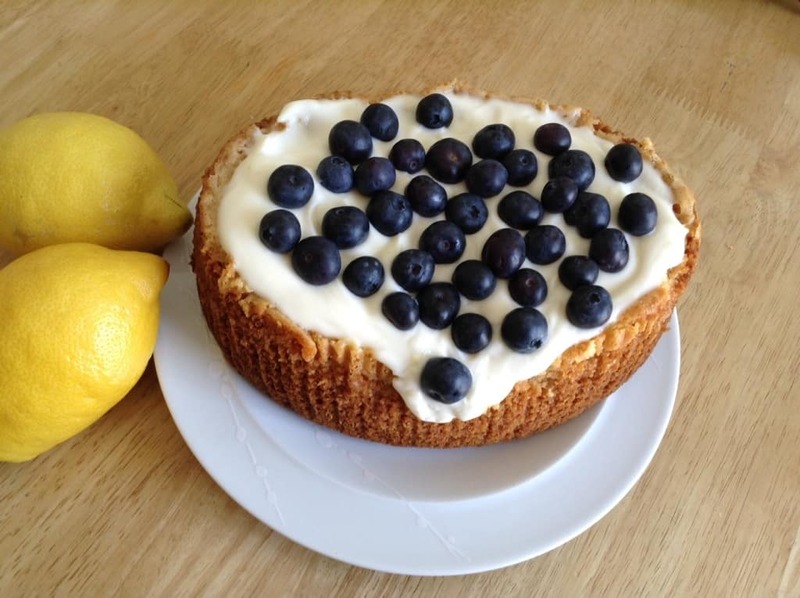 Read on for my recipe for slow cooker white chocolate and lemon cake! Lemon creamy icing also seems to call out for the addition of blueberries! Blueberries and lemon are such a spring like combination, just love the freshness of these flavours. The crème fraîche icing has a hint of lemon flavour from the lemon zest and lemon juice you add to it. Delicious. Melt the white chocolate and butter together in the microwave. In my 1000 watt microwave this took 90 seconds. Stir until smooth, then stir in the lemon zest. In another bowl, whisk the sugar and eggs together. Add the melted chocolate mixture into the egg and sugar mixture, and whisk again. Fold in the flour until just combined. Don't overmix. Grease and line your slow cooker bowl. This was made in my 3.5 l slow cooker. Pour the cake batter into the lined bowl. Cook on high for 2-3 hours, or until a skewer or toothpick inserted in the centre comes out clean. Note: all slow cookers are different, yours may take less time (or longer! ), look out for burning and remove as soon as the centre is firm and the skewer or toothpick comes out clean. To make the icing, whisk the crème fraîche with the icing sugar for 3-5 minutes, until soft peaks form. Stir in the lemon juice. Spoon the icing on top of the cake and top with blueberries. Keep the cake chilled. Best consumed on the day it is made. 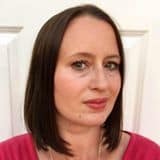 I am linking this recipe with Slow Cooker Challenge over at Farmersgirl Kitchen. This looks great, just my kind of cake/dessert. Thanks for joining me for the Slow Cooker Challenge. 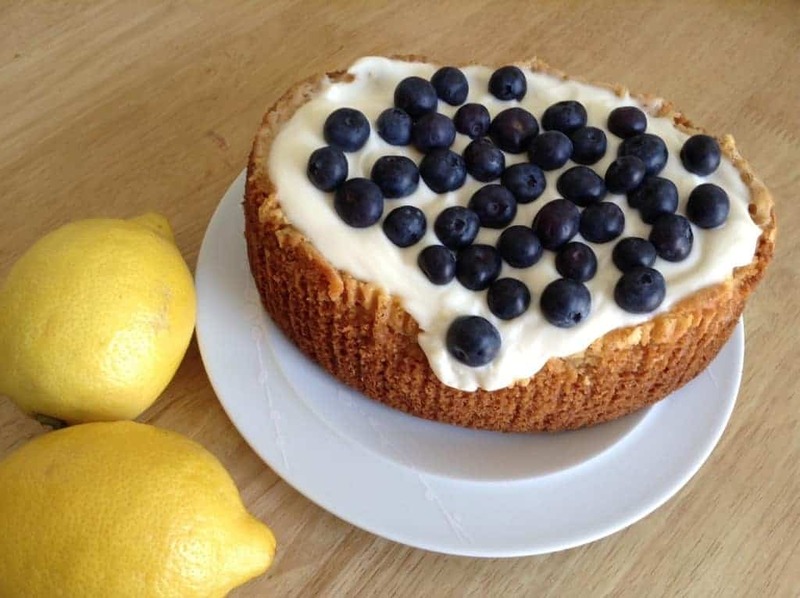 I love blueberries and lemon together, this cake looks great and perfect for the warmer months. Thanks for linking up to Sweet and Savoury Sunday, stop by and link up again. Have a great day! !